Yichang is the second largest city in Hubei Province after the provincial capital of Wuhan, and the site of the Three Gorges Dam. With a population of around 2 million inhabitants in the urban area, it is a medium-sized city. The Asian Development Bank (ADB) provided project clearance in December 2011 and based on a Technical Assistance (TA) study in mid-2012, carried out fact-finding during December 2012, and approved a loan for project implementation in August 2013. The loan agreement for $150 million was signed in October 2013. Xiaomei Duan from the Guangzhou Municipal Engineering Design and Research Institute (GMEDRI) and Karl Fjellstrom from Far East Mobility were the National Team Leader and Team Leader respectively in the ADB TA study to provide the preliminary planning and design of the Yichang BRT during 2012. This BRT preliminary design work benefited greatly from input from GMEDRI in the early stages, and was carried out on behalf of ITDP in the second half of 2012 and into the first quarter of 2013. GMEDRI's preparatory work started earlier, in late 2011. Wenxuan Ma, who together with Xiaomei Duan is a GMEDRI staff member and key Far East Mobility consultant, was a senior engineer in the project. Remi Jeanneret and Derek Trusler led the BRT modeling and BRT station architecture components of the preliminary plan, and provided follow-up input during 2013-2014. The preliminary design was assisted by accurate bus speed data provided by the bus company from GPS sensors on selected routes, which shortened the time required for surveys. 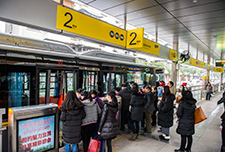 The preliminary BRT design work included BRT roadways and intersections, demand analysis, modeling and operations, station architecture, modal integration, and other system features of the Yichang BRT. Based on this BRT preliminary design, GMEDRI then took over the project, completing the engineering design during 2013, with construction and testing from early 2014 up to mid-2015. In July 2015 Yichang opened Asia’s second Gold Standard BRT system. The city actually implemented two BRT corridors in 2015 with ADB loan funding, from the city centre southward for 13km with 22 stations (opened July 2015) and northward for 10km and 15 stations (mostly open November 2015, with a final 3km section open late 2017). As in Guangzhou, the credit for the Yichang BRT system goes to the city government. Consultants can make recommendations, but it is up to the city (and in Yichang's case also the ADB) to endorse and act upon those decisions, and then to live with the consequences. Under the ADB's East Asia transport division leadership of Tyrrell Duncan, ADB's Yichang project manager Ki-Joon Kim created the conditions for the project to succeed, starting with a very sound project TOR and approach in 2012 which split the Yichang project into an outer road project component (Dongshan 4 Lu, unrelated to the BRT) and a BRT project component. As noted in this article on project risks, providing a separate, smaller BRT-specific component increases the likelihood of getting an experienced and successful BRT planning team compared to combining everything into a much larger contract. The City of Yichang won the 2016 Sustainable Transport Award due to the Yichang BRT. 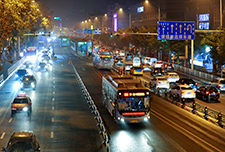 ADB Best Performing Project in 2014 award for the Yichang Sustainable Urban Transport Project, conferred in a country portfolio review meeting in Xiamen on 15-16 December 2015. ADB project manager Ki-Joon Kim, Yichang Mayor Ma Xuming and Yichang BRT project chief engineer Xiaomei Duan ride a BRT bus on the opening day. 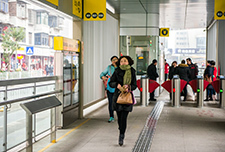 Yichang BRT on the opening day. While there are always minor hiccups, with a sound BRT design in place there is no risk of any major unpleasant surprises. One of the most important early decisions in the Yichang project was whether to use a directional or more traditional offset station. 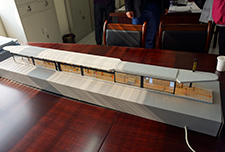 The technical team's recommendation for directional stations was approved. As in Lanzhou, where these stations were designed by Far East Mobility experts (with input from Pedro Szasz) and used for the first time on a corridor-wide basis, the directional stations work very well in Yichang. Traffic in the proposed BRT corridor at the time of the preliminary design work in 2012 was not yet heavily congested despite very rapid motor vehicle fleet growth in the preceding few years. 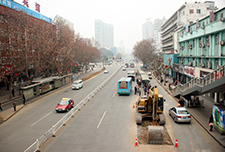 Despite the lack of heavy congestion, after a visit to the Guangzhou BRT and combined with the ADB's BRT preliminary design study, Yichang's city leadership nevertheless could see the trends toward rapidly increasing car usage and decided that action needed to be taken to dramatically upgrade the public transport system. This visionary action is commendable but also unusual. 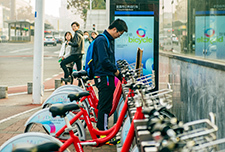 The project also benefited from Yichang's decision to follow the preliminary design technical recommendations on both the BRT corridor selection and the proposed operational design and station configuration. The traffic police were also cooperative regarding the proposed intersection changes, and the ADB project office was quite close to the city government. 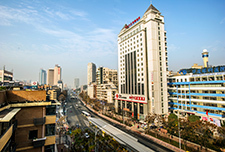 A project working group was set up quite early in the project, much earlier than was the case for example in Guangzhou. 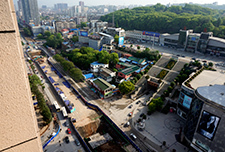 All of these factors meant that in many ways Yichang was a model project in terms of the early project set-up, the preliminary design work, and the decisions taken by the city government. 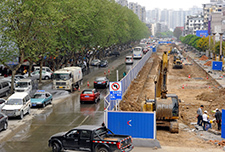 Xiaomei Duan as Chief Engineer of the project for GMEDRI played a leading and intensive role in all aspects of the Yichang BRT project from the early conceptual planning through to the engineering design, construction and operation, traveling to Yichang dozens of times over the period. Wenxuan Ma was also intensively involved throughout the engineering design and construction periods, with other GMEDRI engineers. ITDP's project manager Shanshan Li supported various aspects of the project planning and design, as did Xianyuan Zhu, Li Wei and others. 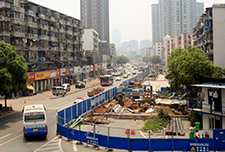 Far East Mobility's Karl Fjellstrom was the overall team leader for ITDP in the Yichang BRT project from the beginning in 2012 through to implementation and operation in 2015. 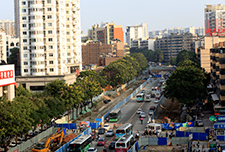 The Yichang BRT has had a range of impressive impacts and led to an immediate and large mode shift from cars to buses in new developments along the corridor. Yichang was awarded the 2016 Sustainable Transport Award in a ceremony in January 2016 following an ADB award in December 2015. 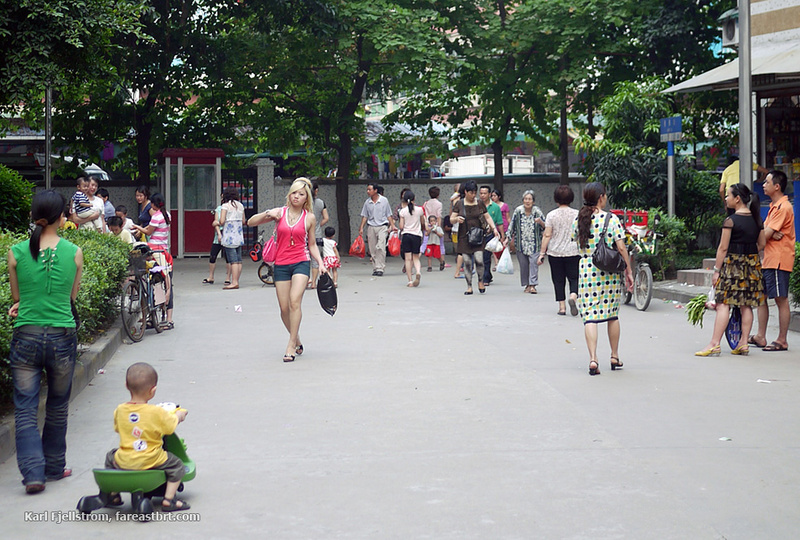 Pedestrians crossing Dongshan Avenue before the BRT. Crossings were infrequent and unsafe, especially at night. Pedestrians crossing the BRT corridor. 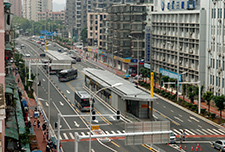 As in Guangzhou, conditions for all road users were greatly improved with the BRT implementation.